This heady blend of sci-fi, romance, and revolution reels in the reader from the start. Author Somaiya Daud has crafted a richly imagined world, rendered in assured strokes with gorgeous poetic language. The Moroccan-inflected aspect of the narrative is so engrossing that when the sci-fi elements (droids, blasters, etc.) crop up, it almost comes as a surprise, albeit a pleasant one. This series kickoff opens with an oppressed people on an occupied planet. Our 16-year-old heroine, Amani, dreams of nothing more than writing poetry and someday traveling beyond her isolated moon, yet at her coming-of-age party, she is kidnapped by representatives of the brutal Vathek Empire. Her only crime: an accident of genetics. She is a near-double for the cruel half-Vathek Princess Maram. 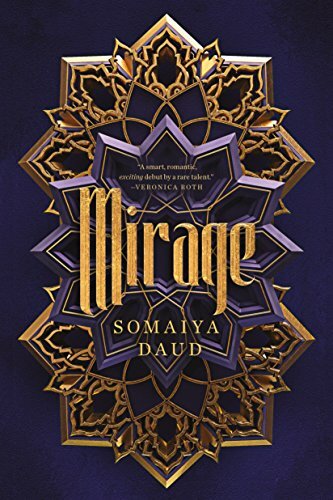 Amani is taken in secret to the royal palace and forced to learn how to impersonate the princess so that she may appear in public in Maram’s place—to die for her if necessary. Allowed no free will, forced to act as harsh and heartless as the princess, Amani nevertheless manages to keep her essential core intact. And she needs it. Glamorous though the royal court may be, it is still a nest of vipers, seething with intrigue. The more Amani plays the part, the more deeply she’s drawn into this world. Still, the court is not without its pleasures—most notable among them, the princess’s charming, handsome fiancé, Idris. As her duties throw them together, Amani finds herself increasingly drawn to the man she cannot have. But she also learns that her Andalaan people are mounting a resistance to The Vath, and that she may have a role to play in this movement, at great danger to herself. While all this is happening, Amani’s empathetic nature begins to complicate her relationship with Princess Maram, who may be more than she seems. In the end, Amani faces a difficult choice and must decide where her loyalties lie. Fans of Sabaa Tahir’s An Ember in the Ashes and Alwyn Hamilton’s Rebel of the Sands will find much to love in this terrific debut novel. Rather than reaching a fully formed resolution, the story sets up the rest of the series with a powerful jolt of brutal reality and a whisper of hope. Readers will be eagerly awaiting the next installment.